I instantly crushed on this image when I saw it on Tumblr a couple weeks ago. 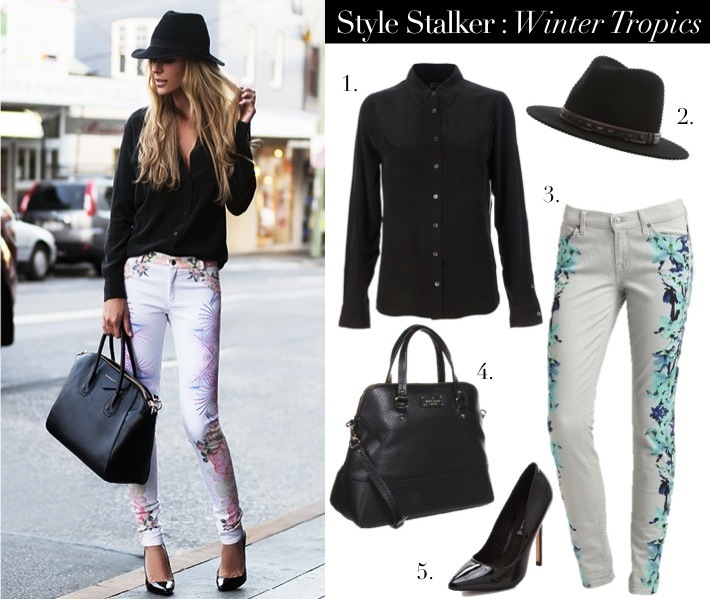 White tropical inspired printed jeans are taken into winter by keeping the rest of the outfit sleek and black. Like the jeans in the original photo from Australian label Bec & Bridge, these 7 for All Mankinds help slim figures by keeping the print on the sides to narrow the line of the legs. I also love that they are a light grey instead of white - just a little more forgiving in my opinion. A must have piece is a black silk button down. Equipment blouses (shown on both sides) are worth the investment, but if you're watching your budget check out this one. For now I'll be emulating this look with the addition of a heavy overcoat, but hopefully Mr. Groundhog complies on Sunday and we can kiss winter goodbye early this year. You recreated this perfectly...love the look! I LOVE this outfit! Especially the hat! Love this look as well! Thanks for recreating! Hot trousers! Perfect look girl! I think that jeans is very flattering.. the half print is clever! What a cute outfit! I just bought a pair of floral jeans that I feel like I can't wear until spring, but after seeing this I've changed my mind! Also, love those hats! woo I love that outfit! I like a lot the jeans too! I am crushing on this outfit too - she looks amazing and love those jeans - such a chic look! Perfect transition look to spring! Thank you so much it means a lot to me !!!!!! How interesting are those pants! I totally agree that if you wear heavy prints like this, the rest of the outfit needs to be toned and sleek. I love the contrast of the black with the tropical print. I'm so ready for spring!